The greatest achievement of the Beatles was actually destructive. In Britain, their success killed off the groups that imitated The Shadows. Fortunately for all, the carnage was quite quick and for most it was sensible rather than painful. There is always a problem with great simple ideas. What originally inspires the talented to deconstruct and repossess with flair soon becomes a cynical opportunity for hustlers and ‘wannabees’. We all have self-serving illusions. There are people who, merely because they are self-employed, proclaim that they are artists and the sad truth is that I have too often been obliged to listen to routine tales about supposed creativity. I have had more than one pint of bitter ruined. Despite the endless boredom, the memories of early 60s guitar groups persists. Not only me remembers the toothy grins, the dodgy suits, collars that rarely fitted properly and bizarre double step dance routines that unaccountably the audience would always applaud. Meanwhile, Elvis was in Hollywood singing nonsense. This was not a time to be a happy teenager. Presumably, this was why everyone welcomed The Beatles with such delight. It was still D-I-Y music with squeaky voices and a timid lead guitarist but most said, ‘Good luck to them.’ At least, they were sincere. The shameless hustlers were run out of town. Only later, did we realise that sincerity and earnestness could cloy as much as cynicism. No wonder, though, people tolerated hippies. Anything was better than Shadows imitators. The irony is that The Shadows were also copiers. They stole their sound from Duane Eddy. He was an American who was born in New York but grew up in Arizona. This was a smart move because he was a tough looking man with immovable hair. He needed a landscape at which he could stare. Indeed, in his later years, he appeared in Westerns as a taciturn cowboy. Not the kind of man we normally associate with guitar virtuosity so late night TV viewers can be forgiven for those moments when they were suspended in disbelief. The first big hit of The Shadows was called ‘Apache’ and this was inspired by the Duane Eddy hit ‘Rebel Rouser’ although The Shadows were unable to catch the heavy reverberation that producer Lee Hazlewood created for Eddy. Supposedly, Hazlewood recorded the hits of Duane Eddy in a huge empty oil tank big enough to hold 2000 gallons. Lee Hazlewood cannot be underestimated because he transformed Nancy Sinatra into a rock star. The albums Hazlewood made in his own name were a disappointment. Without Eddy or support he was merely a failed groovy. Eddy added no nonsense machismo. This is what was odd about Eddy. He was tough without being aggressive. He was the silent hero and it even extended to how he played the guitar. In 2011, Duane visited England again. He had been a regular on British TV in the 60s. He staged a concert in the Royal Festival Hall, which was a sellout. The audience, every man woman and child, stood and roared and they gave him a standing ovation even before he played a note. We should not be surprised. Think of all those guitar groups and the debts they had in their personal accounts. Perhaps the roar was no more than nostalgia and hero worship but it is tempting to think of one or two consciences being cleared. Eddy had strong connections to Elvis. In the 70s, the DJ Brian Matthew had a show on BBC Radio called something like ‘My Top 12’. Rock stars appeared and picked their favourite 12 records. It resembled ‘Desert Island Discs’ but lacked palm trees, sand or nearby ocean. The performer whose records were chosen most by the guests was Stevie Wonder. He was a main man, back then. Inevitably, though, Elvis was selected often. 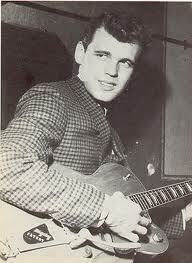 Duane Eddy was the guest one week. He placed 2 Elvis records in his top 12. He was the only person who ever picked two records by the same artist. Recently, Eddy has recalled a conversation with Elvis. They had talked about what they liked in music. Elvis admitted to Eddy that he had a reactionary hatred of stereo. Elvis was a mono fan because he felt the listener should feel the music as a block of sound that went somewhere deep between the ribs. It is extreme to say so, but there is an argument that stereo as much as whatever happened in the Army contributed to Elvis becoming increasingly uncertain after 1960. In 1970, Elvis covered the Sanford Clark hit, ‘The Fool’. Lee Hazlewood had written the song and produced the original record by Clark. Although the version by Elvis is actually musical the version by Clarke is stripped down minimalism. A simple repetitive beat with a hook in each line that is no more than a pause but somehow works. In the final phase of his career, Elvis could be easily distracted. During the 1970 sessions when Elvis recorded ‘The Fool’, he messed around with the band between takes on ‘Peter Gunn’. The version that Elvis remembers is that by Duane Eddy. It is obvious from how Elvis attacks his guitar and how his screams of delight imitate the wailing saxophone. Elvis always had a taste for crude music that worked. Everything leads to the future. Punk bands in the 70s played their instruments badly and substituted a screaming rage for a lead vocal. They argued it was valid protest and what they were doing would claim rock and roll for the ordinary. They were a little late, of course. 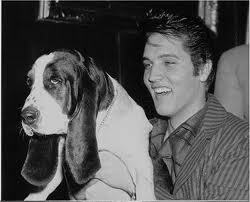 Elvis had already insisted on the rights of the oppressed when he sang ‘Hound Dog’ on the Milton Berle show in 1956. It may not have been the first rock and roll performance but it was revolutionary. Now it is fashionable to dismiss the ordinary, which is why that performance is usually only seen as representing sexual liberation. But, like the punks, his angry nihilism insisted on more. The silent masculinity of Duane Eddy always denied anger. Possibly, his dark sound had musical rather than psychological roots. Whatever the source, it helped a lot of young men look tough on the dance floor. If there are middle-aged women who remember hostile stares from their dancing days and need someone to blame then Duane Eddy played his part. He was famous for inventing the ‘twang’. Inevitably, this led to some dodgy album titles. The ‘twang’ consisted of Eddy playing the bass strings on his guitar. The reverberation provided by Hazlewood ensured that it dominated rather than supported the record. The technique was not original but Eddy was unique because he used this simple approach to forge an identity and style. Few will claim that Duane Eddy is a virtuoso but his catalogue covers all genres. His latest album ‘Road Trip’ is quite subdued and haunting. It evokes an inescapable highway stripped of prospect and certain destination. He has, though, played everything including, unbelievably, gospel. He succeeds because he appears to be without an ego. The sidemen are given prominence when needed. The great saxophonist, Jim Horn, is used to fabulous effect on many of his hits such as ‘Peter Gunn’ and ‘Dance With The Guitar Man’. ‘Last Date’ is a moody ballad that succeeds brilliantly but mainly because of Floyd Cramer or somebody who sounds very like him on piano. Air guitarists who sneer, though, should listen to ‘Rockabilly Holiday’. Duane Eddy handles the up-tempo material very well. Ultimately, it is easy to like the self-effacing, especially when they deliver big hits. And, of course, he was the only rock and roll star who picked 2 Elvis songs on ‘My Top 12’. If you would like to read more about rock and roll click here. If you would like to read about Frankenstein click here. If you would like to read about the author in Brazil click here. Elvis Presley Challenge 56 – Karl Marx, Thomas S.Kuhn and Ringo. ‘Love Me Do’ by the Beatles, and the first Bond movie, ‘Dr No’, were released in the same week in 1962. After that, most British men had a better idea of themselves. Not quite like God and his Creation but the new alternative identities for men were all revealed in one 7-day period. 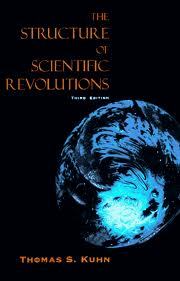 ‘The Structure of Scientific Revolutions’ by Thomas S. Kuhn was published in 1962. Not in the same week but close enough to be relevant. The book introduced the word ‘paradigm’ and the phrase ‘paradigm shift’. It soon became influential even eventually spreading to cod management theory. Kuhn gave an alternative view on how science progressed. Gone was the idea of steady development with knowledge accumulating incrementally over time. Kuhn demonstrated how scientists within any given specialism operate inside a set of defined ideas, a paradigm that determines the acceptable directions available for further research. These limits to understanding continue until enough anomalies are identified to show that the rules no longer match reality. Then the paradigm shifts with a jerk like an earthquake, producing a new frame for research. Science progresses in leaps and bounds which are determined by the community of scientists’ intellectual frame of reference. In ‘Treat Me Nice’, the book on Elvis and the Frankenstein Creature, Howard Jackson talks about ‘cracks in history’ and how rebels and innovators can be suddenly regarded as conformists and conservatives by the next generation. 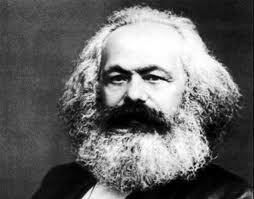 100 years before the Beatles and Bond, in 1862, Karl Marx was part way through the analysis of economics that would eventually become the cornerstone of his most well-known work, ‘Capital’. Three years before, Marx had published (in German) ‘A Contribution to the Critique of Political Economy’ outlining where he thought this research would lead. The 3 or 4 pages in the introduction remain the clearest summary of his thinking about history and change. To Marx, human society is not static, it necessitates constant change. The rate of progress may differ in different periods but change is always inevitable. Like Kuhn, Marx does not see this change as a steady and constant accumulation. Instead it moves in dramatic leaps driven by changes in the relations between people. These relations are determined by the process of production – what we might call ‘the economy – and what Marx calls the ‘productive forces’. To borrow the language of Kuhn, the productive forces create a paradigm within which the rest of society operates. Medieval peasant production supported feudalism and Victorian capitalism facilitated the liberal ‘democracy’ of Gladstone and Disraeli. As with Kuhn’s scientists, these structures initially help production to develop. Cottage industries gave way to factories and then to increasing automation. But there comes a point where the structures created earlier begin to restrain further development. The tension builds, until eventually a revolutionary earthquake destroys the old and a new politics emerges to match the revised economic relations within society. The books of Marx are like the albums of Elvis. Few feel obliged to either read or listen before making judgements. Freud has the same problem. So, before anyone dismisses Marx as wrong they need to reflect on what has happened in Western economies over the last 5 years. The post-Thatcher consensus or self-inflicted paradigm of neo-conservative economic liberalism has torn apart the economy, social democracy and our faith in our current politicians. Few today believe they can cope with the crisis. 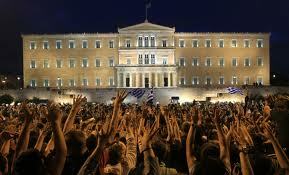 If the situation does not feel revolutionary to you, then watch again what happened in Syntagma Square. That people often still insist on seeing the world as static and unchanging was exemplified in the recent documentary by Stephanie Flanders on Marx. The right wing controversialist, Peter Hitchens, described a world without capitalism as like imagining the planet ‘without weather’. The same mistake was made by the US political scientist, Francis Fukuyama, after the fall of the Eastern European ‘communist’ governments when he wrote a book describing the triumph of liberal democracy as the ‘end of history’. To both Hitchens and Fukuyama, humanity will never develop further. Both writers are constrained by experience that creates its own limits and ‘paradigm’. We struggle to see beyond it and what will exist after capitalism. Marx would have nothing but contempt for the faith of Hitchens and Fukuyama that somehow the direction of human society is dictated by forces beyond the control of the humans that constitute it. If socialism meant anything to him it stood for humanity grasping control of it’s own future. And it is this basic humanity in Marx’s thinking – the emphasis on society as something determined by the people who form it – that makes his thought attractive to many. For some, in the more difficult periods of history, his humanity or hope has been essential. His concern for human suffering in periods of change was forgotten, both by the communists who claimed him as their own and by their enemies in the West who regarded him as the inspiration for totalitarianism. Now the Greek economy and people are sacrificed to placate ‘the markets’. Perhaps it is time to start thinking of solutions that go beyond capitalism and hierarchical visions. In 1962, Elvis’ ill-fated movie career was established. That year saw the release of ‘Girls! Girls! 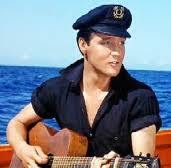 Girls!’, the only Elvis film that still seems to get a regular showing on British television. The movie included the hit, ‘Return to Sender’. It reaffirmed both the great man’s talent, and the extent to which things had changed since 1956. No longer the dangerous rebel he had been turned into the wholesome ‘boy next door’. Months later ‘Love Me Do’ appeared and to paraphrase Apple on the release of yet another iPhone ‘this changes everything…again’. And so it did and so did Dylan and Hendrix and others. 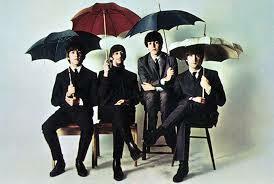 But did the Beatles’ first single truly represent a new paradigm, the beginning of the 60’s proper? What characterised the 60’s was the culture of youth and rebellion, a deliberate turning away from the life of the older generation. The rules of this change were established in the 1950’s, by Elvis among others. 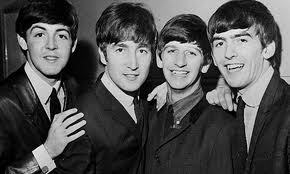 The Beatles were important in the same way that the Large Hadron Collider is important. They defined, proved, and pushed the boundaries of the existing paradigm, ‘normal science’ to use Kuhn’s phrase. But The Beatles operated within the rules established after the revolution of the 50’s, of music focused on a rebellious youth. Talented as he was, by 1962 Elvis never epitomised this paradigm like the Beatles did. Except there is an irony, what Jackson in ‘Treat Me Nice’ means by ‘cracks in history’. Elvis was more complicated than the rebels that followed, and perhaps more damaged. What happened in the 60s was a movement. Opinion and behaviour changed but, as Marx and Kuhn understood, it was not because the paradigm was removed but merely because it was given alternative dimensions. The real rebels are not comfortable in any paradigm. Maybe this was what led to the self-destruction of Elvis and why he became compliant with the wishes of the people around him. The King did not suddenly conform as others have concluded. He merely abdicated because there was nothing in the future to inspire him. Unfortunately, for Elvis there was a sinister Dutch courter in attendance. This man had no knowledge of paradigms and appeared to be incapable of ever imagining alternative dimensions. He was, though, more than willing to exploit the defeatist alienation of a genuine rebel. If you want to read about Elvis, rock and roll and much more click here. If you want to read about Frankenstein and the Creature click here. If you want to read about Brazil click here.